On to Corregidor —Part IV – Fix Bayonets! Three days following the Japanese attack at Cavite, General MacArthur summoned Lieutenant Colonel William T. Clement, the Fleet Marine Officer, Asiatic Fleet to meet with him and Major General Richard K. Sutherland in an attempt to secure the release of Marines in the Philippines from Navy to Army control. MacArthur wanted a battalion to relieve a battalion of the 31st Infantry Regiment to guard his headquarters. Admiral Hart was adamant in his refusal to use his Marines as a guard force. On 15 December, Hart offered a counter proposal: convert the 4th Marines to two regiments, combine them with two regiments of Philippine Constabulary, and employ these forces as a brigade, commanded by Colonel Howard. Admiral Hart convinced Lieutenant General Sutherland that the Marines still needed additional field training after so many years of light duty in Shanghai. 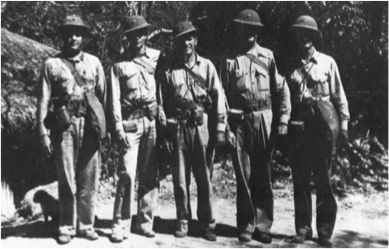 Sutherland agreed and detailed the 4th Marines as beach defense on Corregidor. Later, on 2 January 1942, General MacArthur remarked that since the Marines had no tactical training, they were little use to him as a tactical combat organization. On 20 December, Admiral Rockwell ordered Lieutenant Colonel Adams to move his 1st Separate Marine Battalion to the Naval Section Base at Mariveles —a move that began the next day and was completed by Christmas day eve. 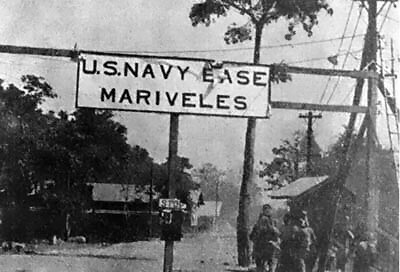 Second Battalion, 4th Marines began their move to Mariveles on Christmas Eve, completing their relocation and that of the regimental headquarters within two days. Admiral Rockwell then ordered a detachment of demolition Marines to destroy the Olongapo Navy Yard. Moreover, the obsolete cruiser USS Rochester was scuttled in Subic Bay, the PBY ramp destroyed, and all aviation fuel and submarine supplies were destroyed. Whatever facilities not blown up were set afire. On Christmas Eve, Japanese aircraft initially targeted American activities at Mariveles but ended up concentrating on a free-French freighter, the SS Si Kiang. The ship had been interned in Mariveles and a guard of eight Marines prevented the crew from moving the vessel. It its hold were much needed supplies of gasoline and flour, but before these materials could be off-loaded, Japanese aircraft bombed the ship and sent her to the bottom of Mariveles Bay. Two Marines were killed and three wounded in this action. Christmas for everyone serving in the Philippines was nothing if not incongruent; the Marines were served a turkey dinner, but frequently had to run to the trenches to avoid Japanese bombers and strafing by fighter aircraft. Four islands situated near its mouth protect Manila Bay. The largest of these is Corregidor, fortified prior to World War I with powerful coastal artillery and named Fort Mills. The tadpole shaped island is roughly three and a half miles long and one and a half miles wide at its head, and sits two miles off the southern tip of Bataan. The widest part of the island, called the topside, was the location of military headquarters and communications facilities, and a hospital. In the middle of the island was a small plateau, and this is where most of the officer’s quarters and enlisted barracks were located, along with the Malinta Tunnel, a vast storage shelter and personnel bunker. The tail of the island was called bottomside, the location of port facilities, and a small town named San Jose. Most of the coastal artillery was located in the area of topside, which included 23 batteries of 56 coastal artillery guns, 12 anti-aircraft batteries with 76 guns, and 10 searchlights. The 4th Marine Regiment began to move to Corregidor on 26 December; 400 Marines of the 1st Separate Marine Battalion taken across the channel on lighters and then taken by narrow gauge railway to Middleside Barracks. The second battalion moved to the island on the following day, joined by the first battalion two days after that. The fortifications of Corregidor were so substantial that the Marines immediately felt as if they were finally safe. They were told that the island was impregnable —the Marines had nothing more to fear from any Japanese attack, but a Japanese aerial attack on 29 December quickly arrested all good feelings about Corregidor’s fortifications. Colonel Howard began an immediate inspection of the beach defense areas. another week in a free society?..keep praying Mustang! I keep focusing on periods of no more than 24-hours. Sir, what are the lighters you mention in your post? A lighter is a small craft or barge, usually flat bottomed, used to transport cargo and passengers in areas of shallow water. A barge usually relies upon another craft for steerage, while a lighter may have its own engine/propellers.